It should be noted that the erroneous identification of Sde Avraham as a “settlement” is the latest in a long series of “Haaretz, Lost in Translation,” in which the English translations of the original Hebrew articles are distorted or erroneous, invariably depicting Israel in a negative light. A Palestinian armed with a grenade was apprehended early morning this morning between the communities of Yeted and Sde Avraham in the Eshkol Regional Council. He was apprehended by a security guard from the regional security service. According to the preliminary investigation, the Palestinian infiltrated into Israeli territory from the Gaza Strip, after having crossed the security fence in the southern strip. He was transferred to the security forces for interrogation. A similar incident took place in November 2012 when a Palestinian from the Gaza Strip armed with a knife crossed the fence without being detected by security forces in the guard post, and entered one of the houses in the community of Sde Avraham, and wounded a woman. He was shot to death immediately afterwards by IDF forces. 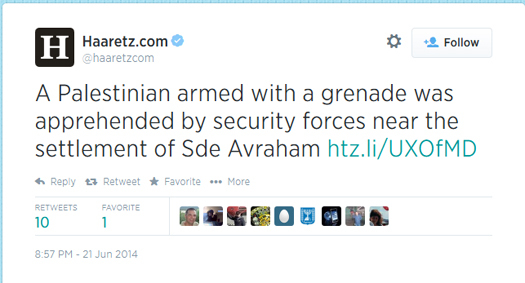 For a detailed list of Haaretz corrections prompted by CAMERA, please see here.